A Day Meeting was held at the Hancock St Hall Double View on Tuesday 16th August 2016 to celebrate three very important events. 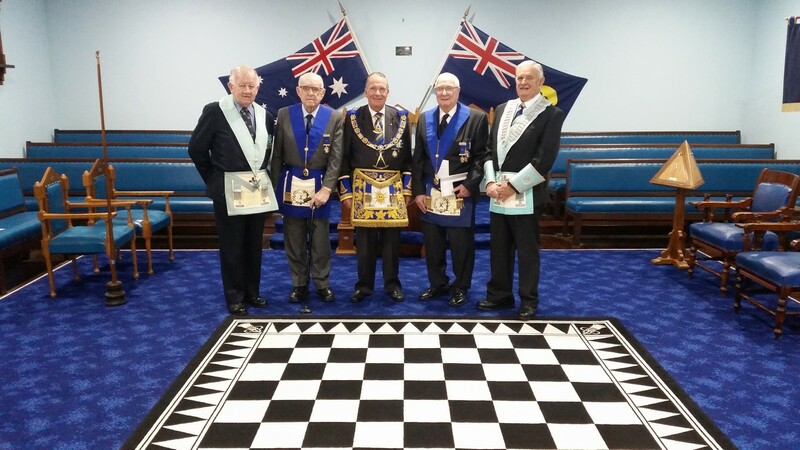 A ceremony was held to retire the Apron of the late V W Bro Albert James Verrier. He was born on the 19th January 1926, educated at Leederville School and Wesley College, married with three sons. He was a member of the J.S.Battye Lodge occupying all chairs except treasurer before joining Seaview Lodge on 15th May 2013 (merger). His community service included Lions Club and Community Watch, he was also awarded the City of Stirling Community Service Award and the Commonwealth Senior Australian Achiever in the 1999 International Year of the Older Person. V W Bro Verrier passed away on the 20th May 2016 aged 90. M W Bro James Maley PGM presented W Bro William Neill Fisher PGSwdBr with his 70 year Jewel and W Bro Robert John Fraser Perry with his 65 year jewel. A good turnout of twenty Brethren which included Seaview members plus visitors from King Solomon, Cambrai and J.F. Walther Day Lodges were in attendance. After the ceremonies all Brethren retired to the South for a very enjoyable lunch.